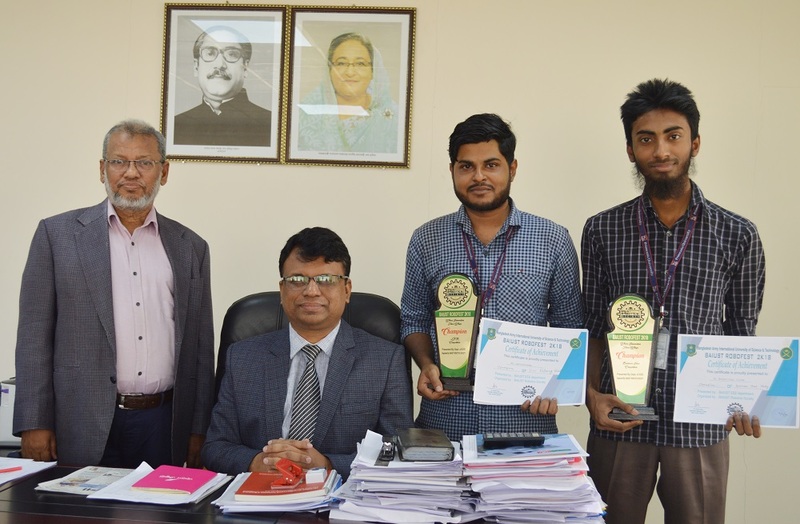 Mr. AKM Ashraful Haque, Vice Chancellor (Acting) and Treasurer of Primeaisa University greeted a team of two students named Md. Mubassirul Islam, ID# 172007042 and Md. Wasikuzzaman, ID 172021042 of Computer Science and Engineering (CSE) of Primeasia University on their wining Trophy of BAIUST Robofest 2K18 and the Champion in an Inter-University Robotics Contest in two categories; Line following Robot and Idea Competition. The Competition was organized by Bangladesh Army International University of Science and Technology (BAIUST), Cumilla on January 21, 2019. They have received Champion Trophy and Certificate in each of the categories. In the compaction, Shahjalal University of Science and Technology (SUST), Military Institute of Science and Technology (MIST), North South University, BAIUST including other Universities have participated as well.